Link to Composites 1962 - 1971 (goes to site of Bobby Ogdin '66, named a Significant Sig in 2015. Some info below from: The History of The Sigma Chi Fraternity 1955 to 1980, by Doug R. Carlson. At the 1962 Leadership Training Workshop, Beta Sigma was honored by Sigma Chi for having the most outstanding Public Relations Program among all chapters. Beta Sigma/UT hosted the Fraternity's annual Leadership Training Workshop in Aug. 1963, with a then-record 666 attendees. It was the first Workshop where an International Sweetheart attended. Beta Sigma arranged for a Knoxville department store to sponsor the trip for Mary Jane Walker, of Michigan State. Her photo in front of the chapter house appeared on the cover of Parade magazine Sunday supplement and publicized the Workshop in newspapers all across the U.S. Beta Sigma's Derby Day film was shown during the Workshop, which was coordinated for UT by Allan Thurman, '59, UT's Asst Director of Conferences. Beta Sigma Consul Jim Hall '63 (later a Significant Sig), coordinated and organized the host chapter's efforts. * In Dec. 1965, Beta Sigma helped conduct the Installation Ritual for the chapter at Western Kentucky State College (now Bowling Green State Univ.). 1966 - 67: Beta Sigma moves from its 2nd chapter house in Circle Park to its new one in the newly-developed Fraternity Park. * On Oct. 14, 1967, we dedicated our new chapter house. Grand Pro Consul Norman C. Brewer Jr. delivered the address, as we celebrated our 50th anniversary. 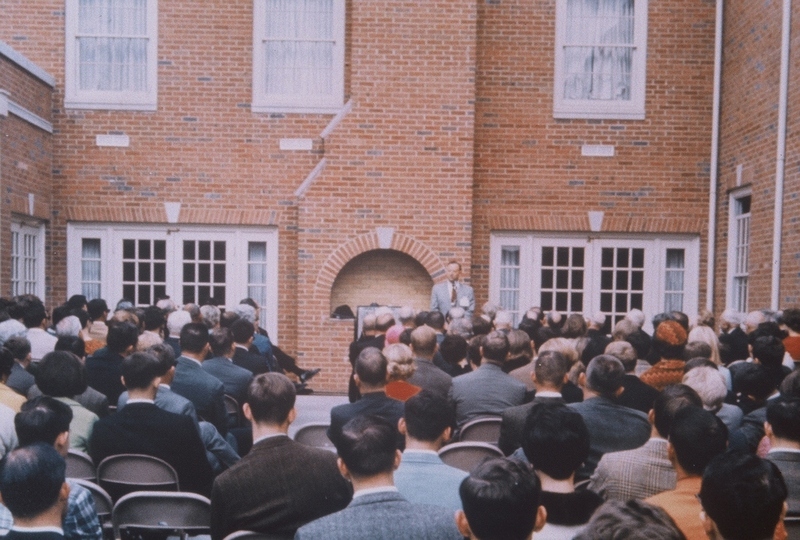 House dedication, Oct. 14, 1967, with Grand Pro Consul Brewer. Beta Sigma/UT again hosted Sigma Chi's annual Leadership Training Workshop, in Knoxville in Aug. 1968. (First time was in 1963). A record 744 undergrads attended; Allan Thurman, '59, UT's Assoc Conference Director, again coordinated. Attending this Workshop was a member of the Leadership Training Board: Dr. Marvin D. "Swede" Johnson, Arizona '50, whose son Marshall, '79, would later serve as Beta Sigma Consul.